Welcome to Knox District Woodworking Club. Work on this site ceased 5/10/2016 after running since 1997. Archives are kept for posterity. If you are interested in anything to do with wood, then we extend to you, our invitation to join our club members on the 1st Wednesday of the month, to see our club facilities, and meet with fellow Club Members. No experience with woodworking is needed, although a passion and interest is expected. Our Club members will be only too happy to share their general woodworking experiences and hospitality with you, but remember, they too have their projects to do as well! However if you desire to participate in a particular wood specialty, join a project group and become involved in some of the activities we regularly enjoy. From carving, wood-turning, furniture building, modelling, rocking horse making, to just talking about wood related matters. Explore the Club facilities offered by KDWC. Membership costs are modest, so come along as a visitor to meet us. You are under no obligation to join when you visit to learn more about the fascinating and rewarding world of WOOD! New member, or want to know about the club, and how it operates? Become a member for a one time joining fee of $50, plus an annual subscription of $75 per annum (also payable at initial joining). Whilst the Club's financial year runs from 1st Sep to 31st Aug, the Membership year officiated at the AGM on the 1st Wed in October, is from 1st Oct to 30th Sept, allowing time for members to arrange their financial status to be eligible to vote. (Fees stated, are applicable for the financial year ending 31st Aug 2015 onwards, subject to change. Previous fee change: year ending 2012). Apply to become a member with this application form. Why not come along as a visitor to one of our monthly meetings (1st Wednesday, 7:30PM) and meet up with fellow 'woodies' and get to see our facilities, and see what projects and fun we get up to! See 'Ingrained' newsletter for latest activities of the club. 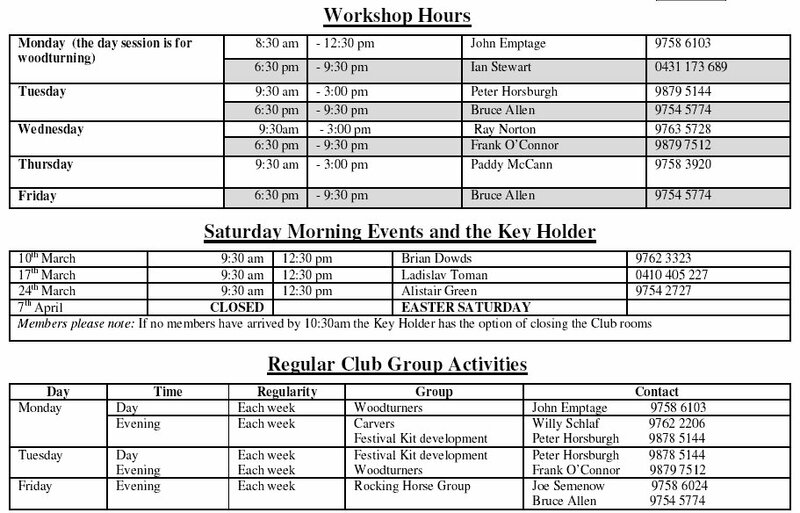 The times the Club is open is something we can boast about - possibly one of the most available clubs around! (in the order of 36 hours every week except Xmas). The last page of the most current Ingrained newsletter outlines the most up-to-date information, but here's just a quick timetable example. 1. To promote woodcraft by creating an interest in working with wood. achieving excellence in design and craftmanship. 3. To promote recognition of woodworking skills.